Home›Movie Reviews›Dracula Vs. Nosferatu - A Look Back at Two of the Most Legendary Vampire Films! DISCLAIMER: This review does contain spoilers for Nosferatu and Dracula (though these stories are so well publicly known now that it may be a stretch to call them spoilers). Read at your own risk. With Halloween just around the corner, this movie fan thought it would be a good idea to go back and take a look at some classic horror movies. This article will be the first of a few I have planned, where we take a look at a few titles, ranging from the silent era to more recent decades. When it comes to horror, vampires are always a popular subject, and arguably the two most popular vampire movies ever made are FW Murnau’s Nosferatu: A Symphony of Terror, a 1922 silent German film starring Max Schreck, and Tod Browning’s Dracula, a 1931 talkie starring Bela Lugosi. These were not necessarily the first vampire movies, or even the first horror films. But they are the ones that have stood the test of time, often imitated but never duplicated. Nosferatu, directed by FW Murnau, was released in 1922. Nosferatu is set in 1830s Germany, in the fictional town of Wisborg. Hutter lives in the village with his gorgeous young wife, and is an employee of Knock, an eccentric old real estate agent. At Knock’s behest, Hutter is sent off to Transylvania to meet Count Orlok, who wishes to purchase one of Wisborg’s old abandoned properties. At a mountain stop en route to the Count’s castle, local superstition runs rampant regarding the Count and who he really is. Upon his arrival, Hutter is equally astonished and perplexed. It is not long before a plague breaks loose in Wisborg, and Orlok’s true intentions come to life. It is up to Hutter to return home and make sure his wife and town are protected from the real source of the threats at hand. It is hard to believe that this film is nearly a century old! FW Murnau would continue to make films after this one, but Nosferatu remains his best known work. Murnau was unable to attain the film rights to the novel Dracula, and worked his way around this by changing character names, plot details, settings, and several other elements, including the villain’s final fate, believing this would be a good way to adapt the story legally. Things did not go so smoothly; Bram Stoker’s widow sued Murnau for copyright infringement and plagiarism, and the courts handed down an edict that all copies of the film be destroyed! The film was very nearly lost, but survived because prints had already been circulating around the world and duplicated. It lives on and is revered as one of the genre’s all time greatest films. 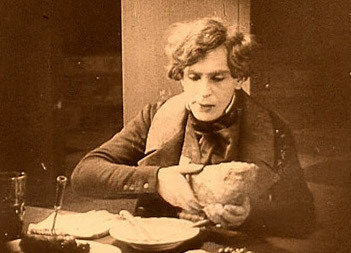 Hutter serves as the protagonist of Nosferatu. As a silent film, this one relies much more upon visuals and the actions on screen to tell the story, and Murnau proves himself a genius in this regard from start to finish. From the peaceful scenes in Wisborg early in the film to the haunted halls of Count Orlok’s Transylvania castle, you will not want to take your eyes off the screen. Murnau makes every frame of film count, whether establishing scenes of peace, or those of sheer terror. Of course, the stand out role in the film is Max Schreck as Count Orlok. Hideous and inhuman in appearance, Schreck becomes evil incarnate and holds nothing back. 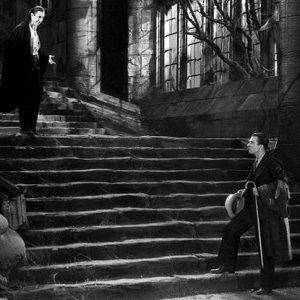 Scenes of him creeping around his castle or rising to his feet from a coffin haunt the viewer, playing all the more a role in establishing a haunting, somber mood. From the moment we first see him, there is no doubt that this is our vampire, our villain, and the antagonist a story like this so desperately needs. Count Orlok is capable of using his powers to make others do his bidding. Knock, the owner of the real estate company Hutter works for, is not immune to this. While no one else in the rest of the cast was as well known as Schreck, they serve their purposes in this tale well enough. From our young hero to a man in town gone insane by Orlok’s curse, the cast keeps our attention. Fine performances that are ideal for the silent era coupled with brilliant set design for the era make this a classic for the ages that continues to haunt its audience nearly 100 years later. The film is not perfect; though very few are. At 95 minutes, the film is not overly long, but it does become a bit bloated and drawn out, particularly in its latter acts. The movie feels like it would have been better off streamlined and with fewer characters; a scene with a scientist character studying biology, for instance, feels like unnecessary padding, even if it is somewhat relevant to the plot. Had the movie been about 10-15 minutes shorter and given the axe to a handful of the tertiary characters, the final product likely would have held up better over the years. But that is not to say that this is a weak film by any means. Far from it, in fact! 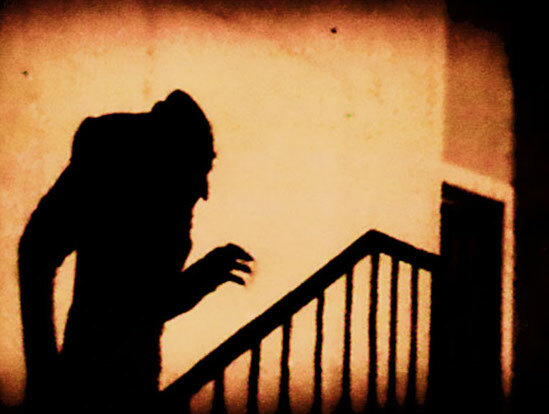 Images like this one of Count Orlok's shadow remain haunting to viewers, even nearly a century later. Nosferatu is not the first film to bring vampires to the screen, but it is the first one audiences truly remember and revere as a horror classic. 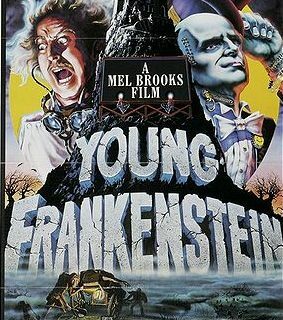 Currently, the film is available on Blu-ray Disc from Kino Video in a two-disc set that includes both an English version with English intertitles, and a German version with the original German intertitles, plus English subtitle translations. 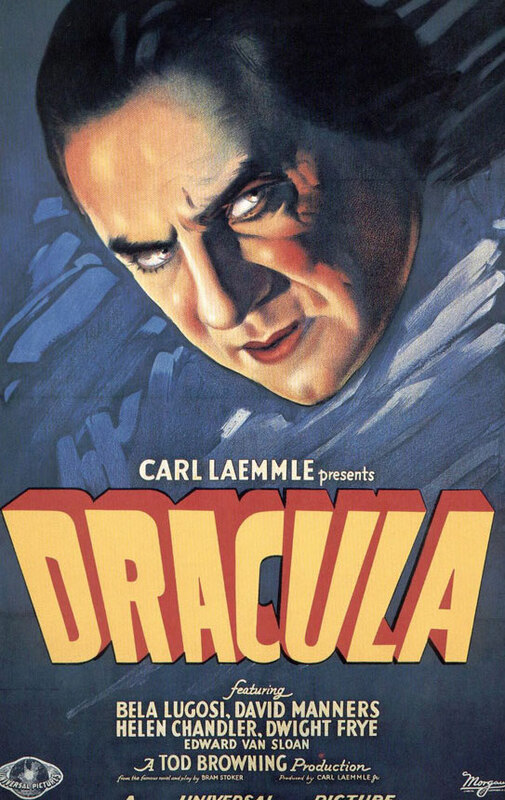 Dracula, starring Bela Lugosi, was released in 1931. In Dracula, the eponymous vampire has taken residence in an abandoned abbey in London, sleeping in his casket by days, and setting himself upon the city’s residents at night. When people are dying of their blood being mysteriously drained, the scholarly Van Helsing suspects that a vampire is, in fact, preying upon those in the city. John Harker is romancing young Mina, the daughter of a local sanitarium owner, but comes to discover that even she may have fallen under the vampire’s curse! It is up to them to unite and stop this menace from wreaking havoc upon London. In his role as Count Dracula, Bela Lugosi left a lasting impact on audiences around the globe. Many still revere him as the definitive cinematic vampire. Bela Lugosi is the definitive Dracula, and it shows from the early frames of this film. His accent, his costume, his trademark glare; THIS is what we think of when we think of vampires today, and rightfully so. Unlike Count Orlok of Nosferatu, who was a hideous, impish creature, Lugosi’s Dracula is a handsome, charming gentlemen who blends seamlessly into the streets of London amongst his peers. In this sense, the menace is much more subtle and far less obvious, which creates quite the obstacle for the film’s heroes and victims. Set design manages to be impressive here as well, from the haunted hallways of Transylvania and Carfax Abbey, to the interiors and exteriors of Seward Sanitarium. When leaving this film after it has all ended, these are images that will be permanently embedded in your mind. The look, the performances, the atmosphere; this is the definitive Dracula movie, despite countless attempts at it over the decades since. Dracula's castle will leave an impression on viewers, even all these years later. Clocking it at only around 75 minutes in its current state (an epilogue was removed following the film’s early exhibitions and is assumed to be lost), the film is quite short, but moves along at a fairly brisk pace. The cast never feels overblown or too large; in this regard it was smart of the filmmakers to adapt the smaller scale stage play rather than Stoker’s novel directly. It is interesting to think how the movie would have turned out on a bigger budget and if it had been a more faithful adaptation of the novel, but let us as fans be grateful for the movie that turned out how it did. It does not matter how much time passes, this will remain the ultimate Dracula movie for all time. With outstanding set design and a performance for the ages by the legendary Bela Lugosi, you cannot go wrong here. Dracula is available on Blu-ray Disc from Universal, both in a Universal Classic Monsters box set, and as a sold separately release. Both the box set version and the “sold separately” version also include the Spanish version of the film as a bonus on the same disc. So… we have two legendary vampire films that are hailed as classics. Which one is actually the better movie? That is a difficult question to which there is no one definitive answer. Here is a look at a few of the different aspects of the films, so we can assess which film is the winner in each category, and if there really IS a winner between the two. This is the most obvious thing to look at when it comes to comparing the two movies; both movies have their own radically different take on the undead, largely as a result of the differences between silent films and talkies. Max Schreck is outright terrifying with his makeup as Count Orlok; one instantly sees him as the menace in his respective film. But Bela Lugosi’s Dracula is a totally different affair altogether. Handsome, refined, and terrifying in a much more subtle manner, this is the best of both worlds. Anyone can put on scary makeup and frighten the audience in an obvious fashion as Schreck’s Orlok does, but Lugosi is the winner here because he is a less obvious, and dare I say it, LIKEABLE villain. 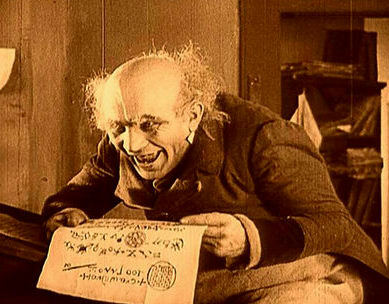 In Nosferatu, we follow Hutter from beginning to end of the movie; he is the one that actually goes to deliver the vampire the real estate papers, and much of the rest of the film is him returning to Wisborg racing to his wife’s rescue; the relationship between Hutter and his wife feels genuine and real. In Dracula, the equivalent of this role is split between Renfield, who delivers the papers but become’s Dracula’s servant (which happens to Knock in Nosferatu) and John Harker, who for the rest of the film more or less remains the equivalent of Nosferatu’s Hutter. John Harker is given little to do throughout the film; even his romance with Mina feels like an afterthought at times. In Dracula, Van Helsing ends up being a more heroic character than Harker. Nosferatu wins here, since we actually follow the same hero from beginning to end of the movie, and he gets plenty to do, not to mention more outright development. Again, this differs substantially as a result of the difference between silents and talkies, and both casts have their strengths and weaknesses. Nosferatu’s supporting cast fills its needs well enough, even if a number of the performances feel like the typical stock performances of a silent film of the day. Dracula has a terrific supporting cast, the most noteworthy of which being Dwight Frye as Renfield, the realtor turned deranged lunatic (and playing both sides of the coin brilliantly) and Edward Van Sloan as an aging Van Helsing, who believes in the vampire threat, and puts forth his utmost effort to stop Dracula. These few key performances put Dracula a cut above Nosferatu in this regard. Dracula, though written in the 1890s by Bram Stoker, is apparently set in a contemporary time period due to the appearance of modern amenities in London. Nosferatu, on the other hand, is set in a small German village in the 1830s. In the latter, heroes have no modern amenities; Hutter must even communicate with his wife via letters carried on horseback; no telephones or automobiles to speak of in Wisborg! Nosferatu wins here because its setting creates another challenge, albeit a less obvious one, for our heroes. In its current state, Dracula clocks in at around 75 minutes. This is short by modern standards, but the brisk pacing enables the story to move along while developing the plot and the characters as necessary. 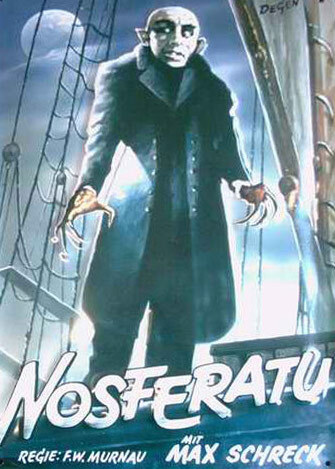 Nosferatu is roughly 15-20 minutes longer and does an equally good job of development of both story and personnel, but there are a few scenes, characters, and moments that do not feel overly integral to the overall plot, and probably could have been axed. The shorter and more concise Dracula wins here. Again, much of this stems from the nature of the source material. This incarnation of Dracula is based upon a stage play, so the sets are generally smaller spaces and interiors (actually a smart move on the filmmakers’ part to save money). Conversely, Nosferatu has an entire village, more chambers and rooms to the haunted Transylvania castle, and many other interesting locales, interior and exterior alike. The earlier movie is the winner on the basis of “world building” via its sets and the like. For a vampire threat to be credible, said vampire has to leave a trail of corpses in his wake, and a few new vampires to be born. Count Orlok needs blood for sustenance, and does not create new vampires. Despite his menace, he kills very few in his travels aside from the crew of the ship that takes him to Wisborg (and it could be argued that their deaths are more plague-oriented than directly related to Orlok himself). In Dracula, the titular character has already created vampire wives back in Transylvania, and on his first night in London, wastes no time getting down to business. Lugosi’s vampire definitely has the higher body count. 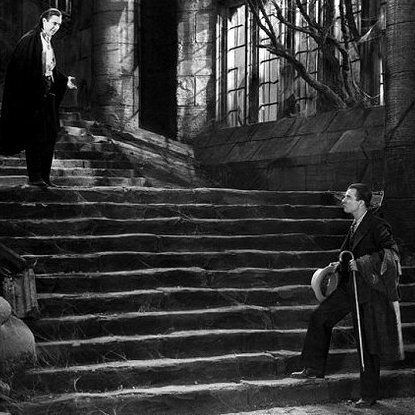 Murnau changed the ending of the original Dracula story as one of his stipulations to try to avoid legal repercussions, which unfortunately did not work for him; at least not from a legal standpoint. In Murnau’s version of this story, Hutter’s wife sacrifices herself to the vampire, letting him feed on her blood until the sun comes, and his overindulgence and gluttony results in the first rays of the rising sun disintegrating him into oblivion. The hero has lost his beloved, but her sacrifice ends the threat of the vampire, bringing peace to Wisborg. In Dracula, Van Helsing and John Harker discover Dracula’s tomb, and Van Helsing pounds a stake through his heart, ending his threat and setting Mina free from his curse. In Nosferatu, the ending is bittersweet, but a sacrifice had to be made for the victory, for the greater good. Dracula’s ending is a little too convenient and “happily ever after,” and leaves us with unanswered questions. This is one of the instances where Murnau’s changes were for the best. Okay, time to have some fun. This one is juvenile, but I simply could not resist. If the two vampires from these classic films were pitted against one another, who would win? Count Orlok is the more frail creature; he is destroyed outright by sunlight, is apparently unable to create new vampires, though he apparently has some degree of mind control, as he demonstrated from afar with Knock and Hutter's wife. Dracula shares Orlok’s weakness to crucifixes, however he is only merely weakened by sunlight rather than destroyed by it. Orlok has his apparent mind control which can function from hundreds of miles away, though it is not clear if he is capable of turning into a bat or a wolf like Dracula (we see a wolf said to be a werewolf early on in Nosferatu, but it is never stated if this is actually Orlok). Lugosi’s Dracula can transform into these creatures, bite people to make them his victims, enslave people, and apparently has some degree of psychic power that he attempts to demonstrate on Van Helsing. 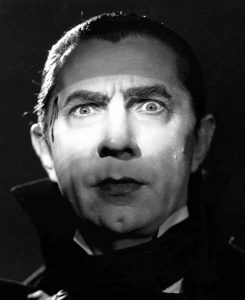 While both have their share of strengths, Lugosi’s Dracula has far more of them, and that is why he wins the fight. So what movie is the big winner? The plain and simple answer is that there is not one; both movies are excellent, cinematic classics, so why not watch both this Halloween? Nosferatu is a classic of the silent era, and the movie that put the fear of vampires in so many. But Lugosi perfected it in Dracula with a more subtle menace, which is no less effective. 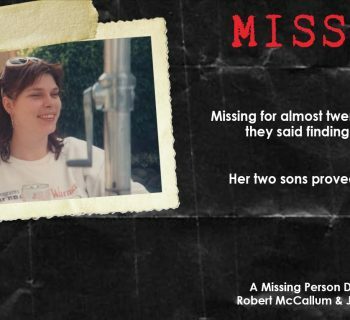 Both films are available on Blu-ray Disc and are easily accessible via online stores, so what are you waiting for? All images/photos/characters/etc. here are the property of their respective holders, including but not limited to Universal Studios, Kino Video, Prana Films, and The Estate of Bram Stoker. All opinions given here are strictly those of the author and are for entertainment purposes only. Said views do not necessary reflect the opinion of any of the following entities, and/or other ZRock'R Magazine personnel.